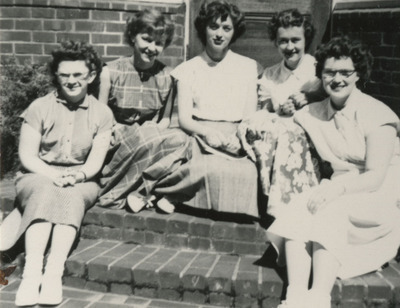 Five nursing students of the Good Samaritan School of Nursing sit on the front steps of the Graduate Nurses' Home in sundresses and enjoy the sunshine. Unknown, "Nursing Students Enjoying the Sunshine" (1951). Good Samaritan School of Nursing Photographs. Image. Submission 196.